If I were better with words I would be a writer or a poet. If I could sing or play music, I would convey my thoughts in some melodic form we could all tap our foot to. For whatever reason, I choose to tell stories through sculptures. Through sculpture I want to illustrate my interpretation of the life experience and shared commonalities of human thought, emotion and irony that occupy our days. I seek understanding by searching the clues that exist in every living thing and object we interact with. The path of humanity is in constant motion. The here and now connects the past and future. It’s worth analyzing our place in the world with humor and objectivity without taking ourselves too seriously thereby enjoying what we have. Every object created possesses some aspect of its creator. The use of tools has long been considered to be the thing that separates us from other animals. The complex evolution of our tool-making has coincided with our development of a civilized society. Nothing exemplifies this more than our everyday eating utensils – the knife, spoon and fork. These specialized tools have become an essential part of not only nourishing our bodies by have also become an integral part of the social ritual of meal time and are symbolic of the human dialectic. The KNIFE is symbolic of division. Division can be a force which creates animosity or distrust. Division can also be beneficial by allowing larger tasks and concepts to be broken down into manageable pieces such as in a division of labor. The SPOON is an element of support. Support is typically construed as being compassionate in the process of growth and developing self-reliance. Over-reliance on support achieves the exact opposite of that intended goal. 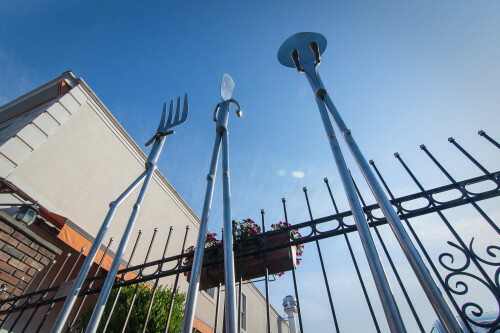 The FORK represents inquiry. It is a tool that is designed to securely hold and manipulate food so that it may be devoured all at once or held in place to be delicately examined and consumed bit by bit. Inquisitiveness is necessary in the development of awareness. The negative connotation of holding an inquisition is one in which only more questions are presented for an already predetermined answer. Zebra Cactus is an enlarged version of an haworthia fasciata succulent plant. This is a plant adapted to hot dry climates. The spiky leaves minimize exposure to the hot sun. The thick flesh of the spikes store water for long periods of time. Deserts are expanding around the world. 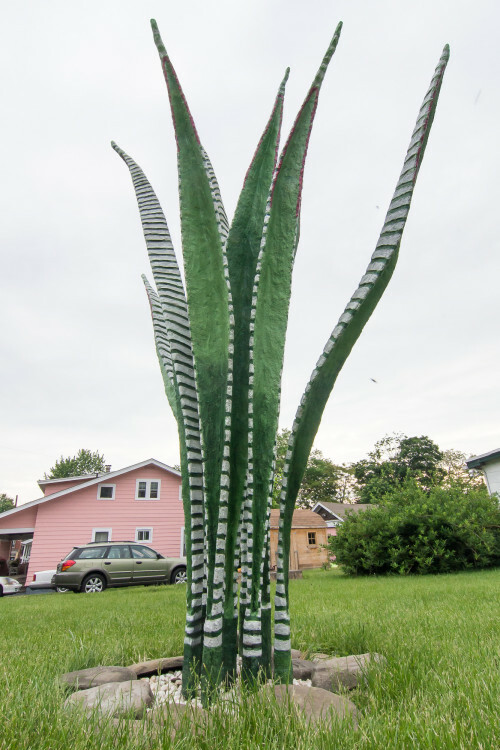 We may be seeing a lot more of these types of plants. My sculpture has a welded steel armature covered with steel hardware cloth. Several layers of cement are applied and the last layer is carved into bands. 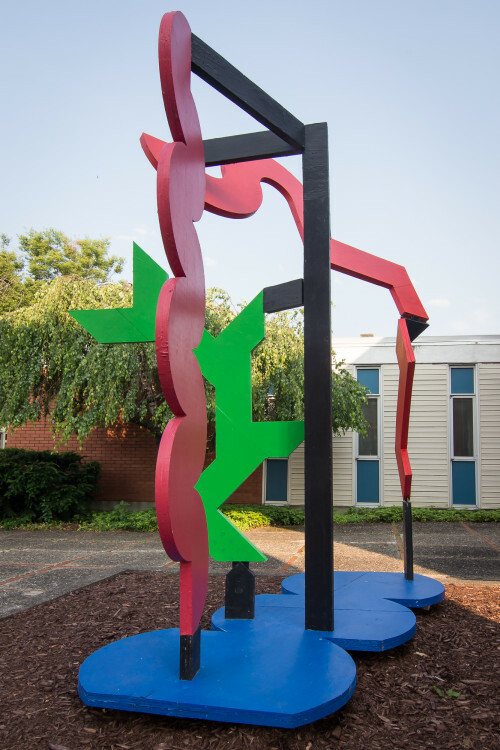 All eight leaves are free- standing mounted on a steel plate at the base of the sculpture. 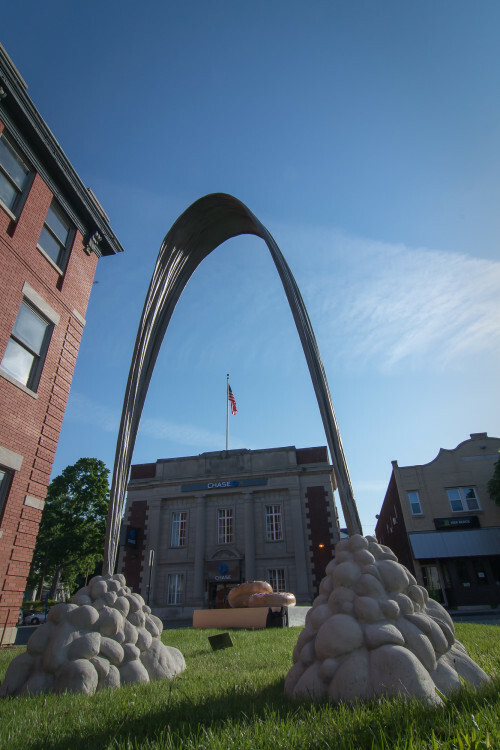 The sculpture stands eight feet and eight inches high and is 55 inches wide. My life was mostly centered in New York City until eleven years ago when I moved to Northeastern Pennsylvania, where I live and work. I have been included in numerous indoor and public art exhibitions, mostly in NY State and Pennsylvania and I have received awards including a Puffin Foundation grant for creating a collaborative sculpture, Ocotillo Patch. This sculpture is about capturing a gesture. In the studio, I transform old metal tools and industrial relics into wax, so that I can bend, twist and form them freely by hand. This state of malleability allows me to manipulate and deform the object in an instinctual way that would be impossible in its metal state. This technique makes sculpting more akin to drawing – a loose practice that allows for spontaneity and evidence of the artist’s hand. Once the pieces are formed, they are cast in metal and returned to their original rigid material state. Phototropism and gravitropism are competing forces innature: one that uplifts objects towards the sun, and the other, a gravitational weight that pulls downward. This sculpture is about capturing those opposing forces. It represents all things, natural and inorganic, which rise proudly, and eventually corrode, erode and deteriorate. They are structures. They are flowers. They are people. They are simple gestures of rise and fall, of growth and gravity. 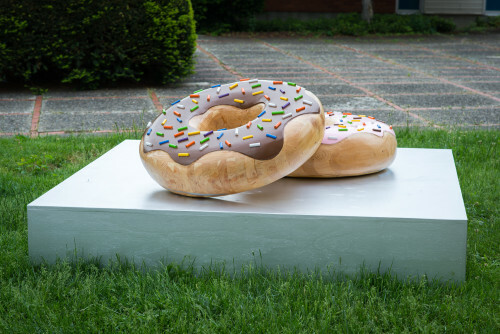 Charlie Engelman was born and raised in Los Angeles, California and moved to New York in 2006 to attend Skidmore College where he received his BFA, focusing on metal sculpture. 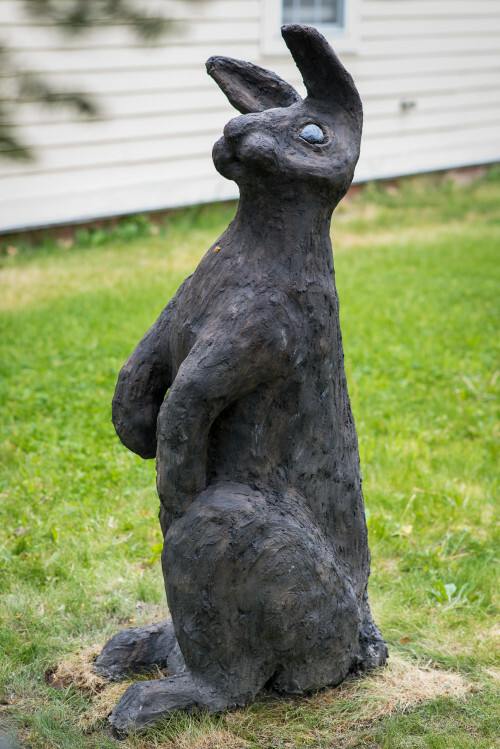 Continuing his technical education, he worked as an apprentice to a metal sculptor for several years, and at Polich Tallix Fine Art Foundry, where he fabricated large-scale cast metal sculpture. 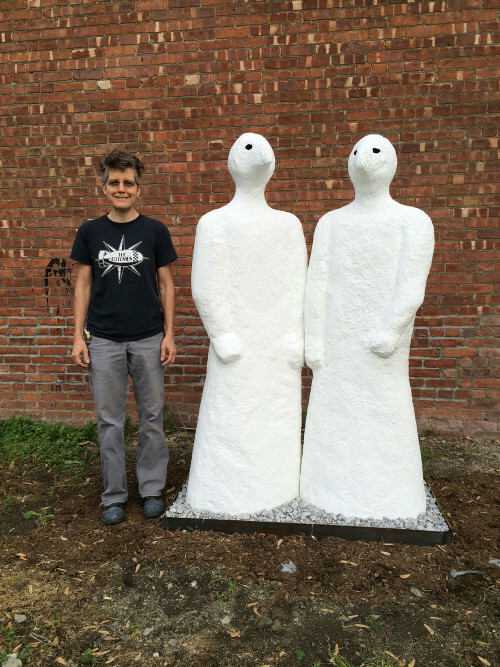 He currently lives in Beacon, New York where he shares a studio with two other artists. 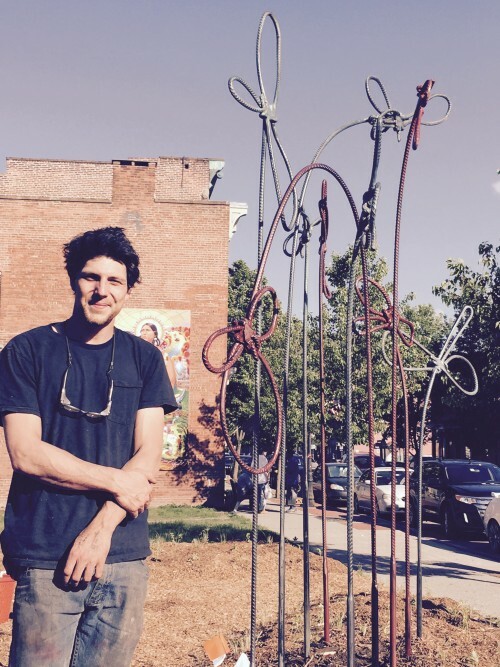 Throughout this time he has pursued his own sculptures and, along with several other Beacon artists, developed the community art event, Hefestus. Grounded Rainbow is part of my current body of work exploring the origins of power and how we often create and support the systems that aid in our own oppression/libertation. Each piece is, in part, a monument to the human condition using the language of architecture. With my materials I aim to capture the energy of movement, a moment in time – as if to preserve a tiny portion of a life in order to keep it from being forgotten. This piece in particular is a monument to the child’s imagination and all the hopes and aspirations encompassed within it. It reaches toward the sky with a sense of fearlessness and possibility, yet at the same time it is grounded – with the realities of our world and the complexities of human existence. How these dreams and challenges are deciphered will ultimately determine what that child becomes. Lori Merhige was born in 1975 in Teaneck, New Jersey. She earned a BFA in Illustration from The School of Visual Arts in 1999. In 2009 she received her MFA in Sculpture from CUNY Hunter College and was a recipient of the Tony Smith Award. She lives and works in Beacon, New York. Linear Series #2 is an exploration of constructing and combining two and three dimensional forms based on mathematical and modular constraints in a non-rigorous way. The final result of this combinational zeitgeist resolves into a narrative between the articulated forms within a semi-grid structure support system. Peter Schlemowitz (b. 1940) is a sculptor, building and furniture designer and painter whose residence and studio have been in Beacon, NY since 2002. His artistic roots are based on his immersion in the San Francisco Beatnik art, film and poet milieu in the 50s and in the New York art scene from the 50s; the 10th Street artist co-op galleries and the Cedar Bar – through the Soho and Lower East Side second-generation New York School and Pop Art galleries era in the 60s and 70s. His technical artistic skills were honed by a parallel career first as a carpenter and construction manager involved with renovating and restoring landmark buildings in New York City and then as a software engineer consulting to Fortune 100 corporations in the US and Europe. His most recent work is a merger of his artistic, construction and software background with the latest advanced CNC and CAD technologies. My current fascination involves identity. Having an identical twin sister becomes a starting point to launch my explorations. By manipulating different materials, I am trying to find the unknown in a visible way. Using multiplicity of my reality as a means through which to communicate creates tangible outcomes revealing more than I can ever verbally communicate. Jennifer Smith was born in Pittsburgh, PA in 1964. She graduated from Rochester Institute of Technology’s School for American Crafts in 1986 earning a BFA in Glass. After college, she moved to Beacon, NY to pursue a career in sculpture and painting. “My newest works are Solar Windows where I use recycled antique house windows where all 50 glass panes are covered with 50 photo transparencies. The windows are constructed to resemble a large vertical hollow cube. The interior space is filled with about two dozen small solar lights which illuminate the sculpture every night. The imagery is a cacophony of various eclectic images culled from two decades of inventory of my photo works. Franc Palaia is a New York/New Jersey based artist working in multiple mediums including photography, murals, sculpture and books. He is also a curator, educator, writer, signmaker, graphic artist, gallerist, musician, film and TV producer and host. He has been the recipient of numerous awards including grants, fellowships and commissions and has an extensive exhibition record. Lustration exemplifies the powerful human spirit that both contains and reflects the world. 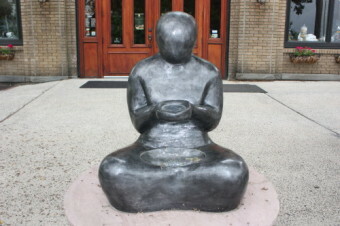 Introspective and inquiring, the simplified Buddha-like figure suggests a larger perspective, as it sits calmly between two trees and gazes into a series of reflective pools. 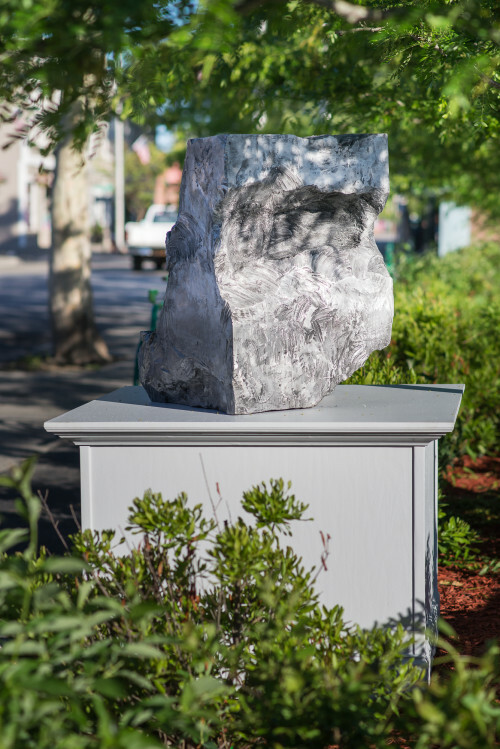 Whie focusing on the concentrated being of an individual, my sculptures open out to wider contexts of human relationship: to family, to community, to local history and to the natural world. The diverse media I use – from cast resin, cement, steel and clay, to mesh, found objects and mirrors – are chosen for specific situations or states of mind. Some works are centered and grounded while others incorporate air, shadows, reflected light and glittering surfaces to convey a radiance within. 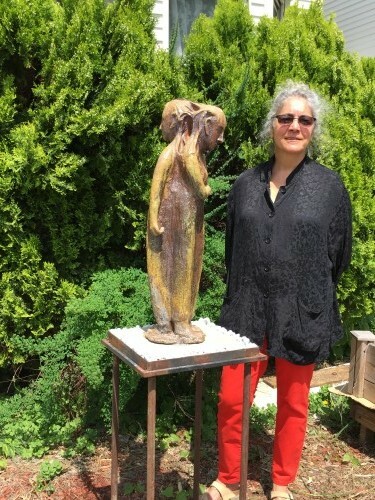 Haviland’s abstract-figurative sculptures and public installations have been exhibited in galleries, parks, museums and educational settings. Awards include grants, fellowships and residencies at such venues as Sculpture Space, Skowhegan and Yaddo. Her work reveals a particular interest in birds and avian mythology, human and natural gesture and images of women. Haviland earned a BA from Yale University and an MFA from Hunter College. She lectures independently and teaches sculpture at Borough of Manhattan Community College, CUNY. The character in Shakespeare’s Twelfth Night, Viola, is shipwrecked and distressed because her twin brother, Sebastian, may have been lost at sea. In order to get a job with Duke Orsino of Illyria she disguises herself as a man and calls herself Cesario. The Duke asks Cesario to woo Olivia on his behalf. Unexpectedly, Olivia falls in love with “Cesario” and Viola falls in love with the Duke and the Duke seems to fancy Cesario but in the final dramatic disclosure, he is (also) in love with Viola and, Viola’s twin brother, having survived the shipwreck, falls in love with Olivia. Really? Well, Shakespeare draws no (analytical) conclusions but cross-dressing, cross-gender and cross-purposing ignite some serious introspection from the audience: Who am I? Why? What for? 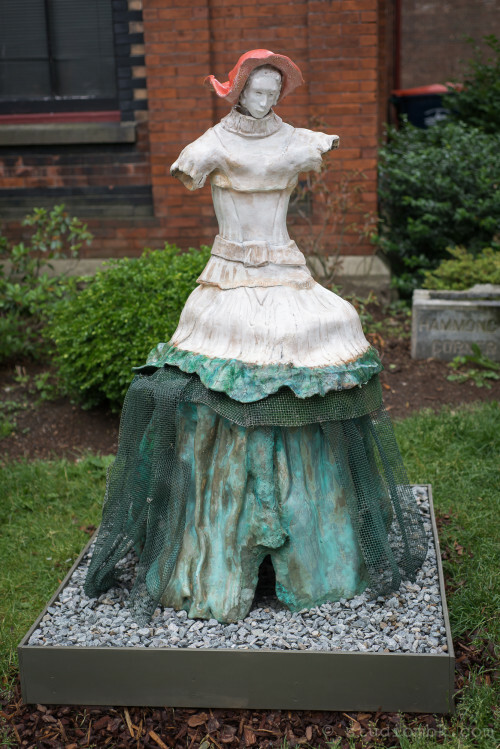 The sculpture, Viola_As I am Woman is inspired by contradictions of disguise and revelation, impermanence and everlasting, honesty and deception. I was born and raised in Chicago. In 1964 I earned a BA at the University of lllinois, moved to NY, raised a family and when my youngest was 8 years old, I returned to formal studies and earned my MFA at SUNY New Paltz in 1993. 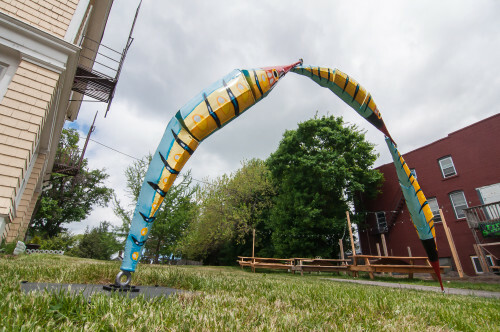 Straight out of the program, I received a series of public art commissions lasting from 1995 through 2004. With several artist residencies – two at the Vermont Studio Center and another year-long one in Ellenville, NY, I focused on a studio practice. The local Hudson Valley projects include the Morse School Hudson River Mural in Poughkeepsie, Mill Street Loft Mural, Poughkeepsie, Ulster County Poorhouse Memorial in New Paltz, NY, Anderson School for Autism , the Rosendale Rhinoceros in Rosendale, NY and a 60′ concrete whale on the Hudson River in Poughkeepsie. For three years I taught at Marist College; one year visiting professor at SUNY New Paltz and ten years as a Dutchess Community College adjunct professor. I currently live and work in Cragsmoor, NY. When I’m not in my studio, I love to hike, run mountain trails and make kimchee. 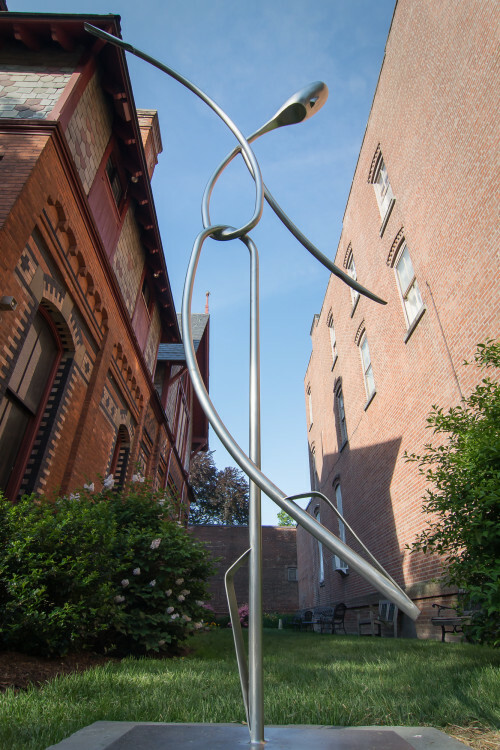 The Exodus sculptures are concerned with the experience of higher awareness and spiritual revelation that results from the movement of peoples throughout the world. These works deal with persecution and human rights violations that create refugees in underdeveloped countries as well as legal and illegal immigrants moving in search of work, food and shelter in developed countries. 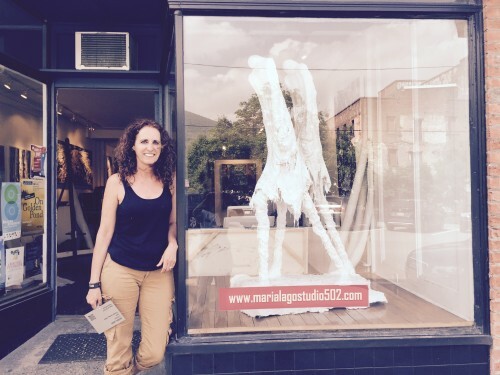 A long-time New York resident, Maria Largo is originally from Asturias, in Northern Spain. She studied Fine Art at the University Complutense of Madrid and at the Circulo de Bellas Artes of Madrid. In New York she studied at Parsons School of Art. This piece is an abstracted reconstruction of a blooming flower. Its biologically-inspired design reflects the geometric patterns and movements of life that already surrounds us. The initial intent for this piece is to serve as an indication of the natural world’s complexity and superior beauty but evolved to be the embodiment of my personal artistic freedom as well. As I am only beginning my artistic career, there are no expectations for my work – a fact that frees me to experiment with materials and concepts with no consequence. I am confident my reawakened perception on art and life is reflected in this piece. I studied sculpture at the University of North Texas and have had the opportunity to work closely with sculptors Ed Benavente and Emil Alzamora since my move to Beacon. 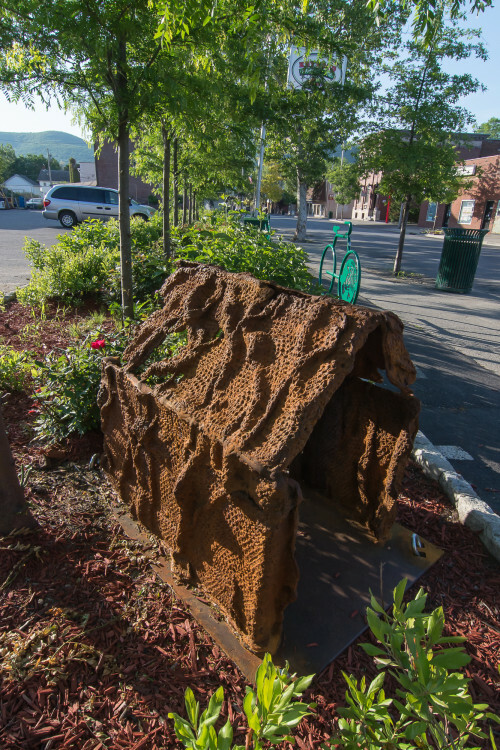 This sculpture of a house was created based off of a painting made out of iron oxide by an elderly woman in New York living with Alzheimer’s Disease. 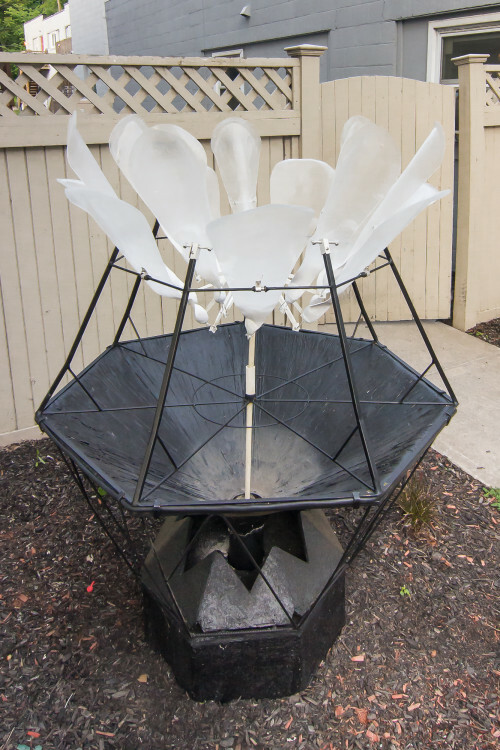 The sculpture is part of an initiative called the Alzheimer’s Glass and Iron project, a cross-generational community arts project with the focus of raising awareness about Alzheimer’s disease and using art as catalyst to comfort grandchildren, caregivers and elderly affected by Alzheimer’s and dementia. Team members certified in the Alzheimer’s Association Memories in the Making Watercolor Class volunteer with the elderly to create watercolor paintings. The paintings are then interpreted into sculptures by glass and iron artists. We host workshops and events to raise awareness about Alzheimer’s. Through this process fading memories become eternal artworks. Rosemarie Oakman was born and raised in New York’s historic Hudson Valley. Growing up she spent summers and winters in London, England and completed several short courses at Central Saint Martins College of Art and Dsign. In Spring 2014 she received her BFA with a minor in Gerontology (the studied of aging) from Alfred University. Rosemarie’s concentration is Metal Casting with a focus on cupola cast iron. At the 2013 National Conference on Cast Iron she was the recipient of the Paige Wainwright Scholarship. She also interned as an emerging artist at Sloss Furnaces in Birmingham, Alabama. Her deep love for the elderly merged with her passion for metal casting to form the genesis of the Alzheimer’s Glass and Iron Project. She is founder and director of this multifaceted, cross-generational community arts project. In Spring 2014, Alfred University awarded her the Richard V. Bergren Jr. Student Innovation Award for this groundbreaking program. I started as a landscape painter in the early 1980s. It was working at Tallix Art Foundry in Peekskill, New York that I was introduced to sculpture and from there I never returned to painting. There was something about sculpture and three dimensions that I was very attracted to. Over the years I had worked with clay, wax and plaster but my true love is working with metal. While some of my pieces are cast, most of my work is fabricated with metal and various found objects. Both poles, thought, impulse, action, electrical. 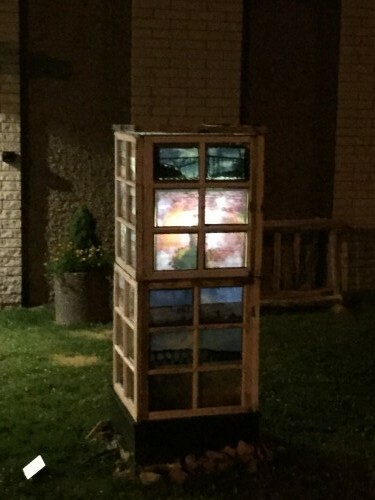 This work titled Transmission comes from a tree in my yard. 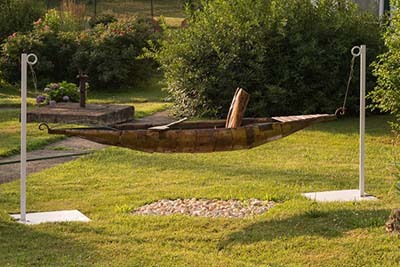 I incorporated two logs sawn from the trunk section of a large cherry tree. One, using wedges and sledge hammer is split through, along the tree’s spiral grown pattern. 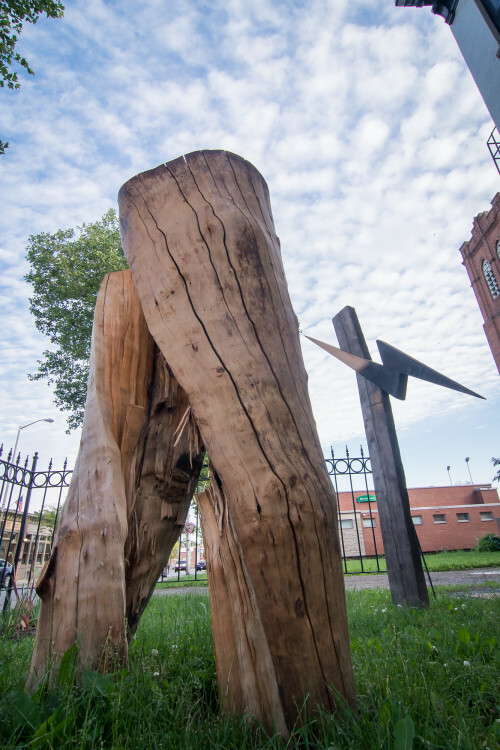 Two, is inlaid with the symbol of a lightning bolt, formed with mahogany wood. Matt Kinney was born in Georgetown, Massachusetts and now lives in Beacon, New York. He attended Pratt Institute and the School of the Museum of Fine Arts. 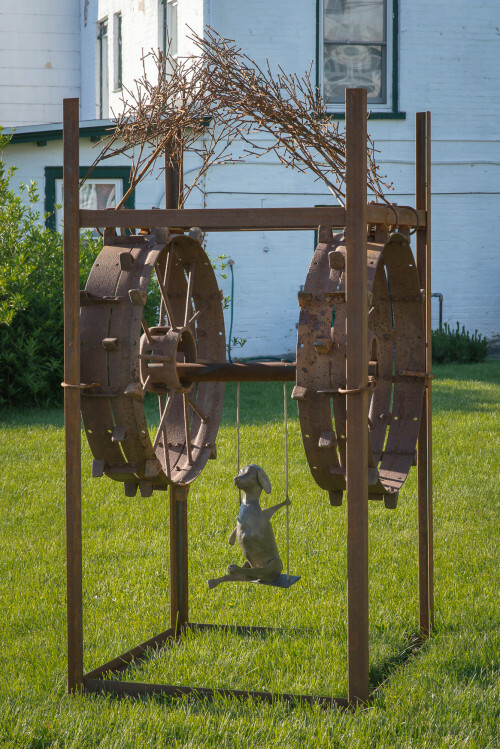 In the past he has worked as a farm hand, at a couple of art foundries and as a carpenter.